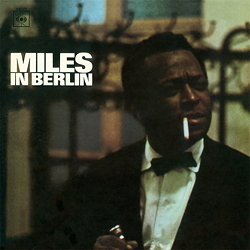 ﻿It's 1964 and the first Berlin Jazz Festival is about to reach its absolute peak: the final concert on the night of Friday, 25th September by Miles Davis. And the European subsidiary of Columbia Records, CBS, couldn’t wait to release this legendary event on LP. The new quintet, for the first time with Wayne Shorter on the tenor sax (and not yet as composer), thrilled and roused the audience in the Philharmonie from the first minute to the very end. The classics "Miles(tones)", "So What" and "Walkin’" were performed at an astonishingly fast pace, the ballads were tender and dreamy. Such a magical atmosphere was rarely evoked at later concerts, which was probably due to the excellent acoustics of the large concert hall. The audience were also seated behind the stage, so Miles couldn't turn his back provokingly on people; sometimes he just squatted on the stage. However, this didn’t prevent him from performing his solos lyrically and tenderly, most of them finely nuanced, soft and gentle, yet audible right into the furthest corner. The rhythmic structure created by the young drummer Anthony Williams provided the necessary excitement. Miles at the top of his form, an enthusiastic audience, impressive acoustics and, to top it all, excellent recording technology and a fantastic pressing on virgin vinyl - what more does a jazz fan want? Now’s the time to dig out your credit card!